Today is more drama than garden, but it takes place in the front garden nonetheless. The changes in the garden are a backdrop to the developing suspense. The colder nights have nipped the impatience in their pots and the leaves are drooping, though the flowers themselves are doing their best to stay upright and in bloom. There is evidence of fall everywhere in the yellow and brown leaves strewn about the front lawn and onto the walkway. The grass isn't as green and lush anymore. And so, we find Dante -- positioned beside the now-empty container of squirrel food. Mama had filled the container at least three-quarters of the way full, but one of the little black beasties decided to climb into it and spilled the entire contents onto the grass and the walkway. Dante immediately hustled over to sniff out the remaining evidence of alien invasion. He stuck his own nose in the dish and breathed in every inch of squirrelly essence. And then suddenly, it appears as if by magic, only to find the Guardian of the Garden guarding the goodies! "Maybe if I look de udder way he'll disappear!" 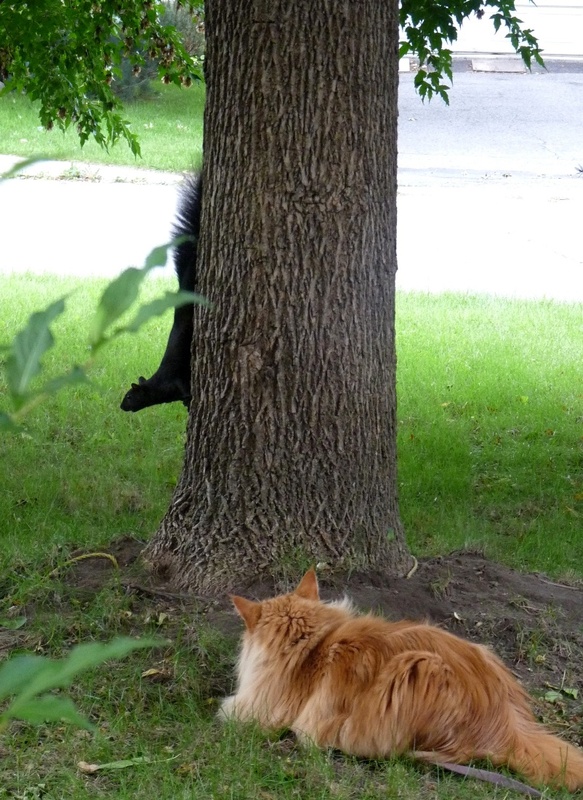 thinks the squirrel, ever-hopefully. Dante seems to be thinking the very same thing. But no! A quick check back confirms the squirrel's deepest fears. Then, they both hunker down for a face-off, but neither will concede a millimeter! In another instant, the squirrel just dashes away, as Dante stares after him. "He sure is fast! ", remarks Dante. And in yet another instant, the wily little creature appears on the opposite side. He has circled completely around, hoping to catch The Guardian off-guard. But Dante's ready for him this time. Did the silly squirrel really think he'd just disappear from his own garden? "This is MY SPACE! 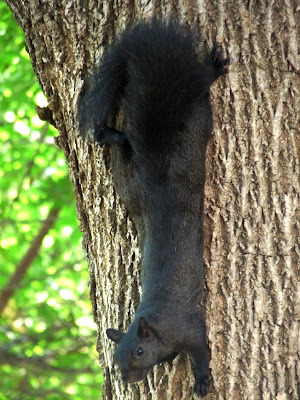 ", declares Dante in no uncertain terms, as the squirrel dashes off. Dante follows him and repositions himself at the bottom of the tree. "I see yoo up dere! ", he shouts. "And dis is MY SPACE!" the squirrel retorts. "I guess dat's fair", admits Dante, as the two amicably arrive at a Peace TREEty! ... but only in your dreams! WORDLESS WEDNESDAY WITH DANTE: AN OLD FAVE! THURSDAY IN THE GARDEN WITH DANTE: PREPARE TO BE ENLIGHTENED! 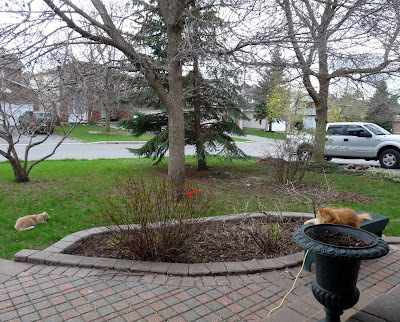 It's Thursday and Dante's in the back yard doing one of his favourite things -- FURTILIZING! 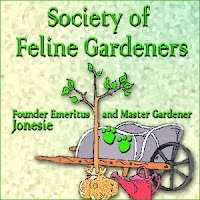 Some of you may recall that Dante's official position in the Society of Feline Gardeners is indeed the Secretary of Furtilization. "If yoo gots it, flaunts it! ", says Dante. And flaunt it, he does! There's an art to this, you know. Notice his PURRfect form. "Let me enliten yoo", says Dante. "Sumtimes yoo hasta furtilize da most in da darkest places." "It makes it much more deliteful!" "Yoo mus' be careful, doe! If yoo lite up any gasses, dey kin explode! An' den it wud all be fur not." "Troo enlitenmint cums frum above!" "So let dere be lite in even da darkest corners! ", says Dante. "An' I tells ya. Dere's nuttin' like a good dump to make yoo feel liter, too!" 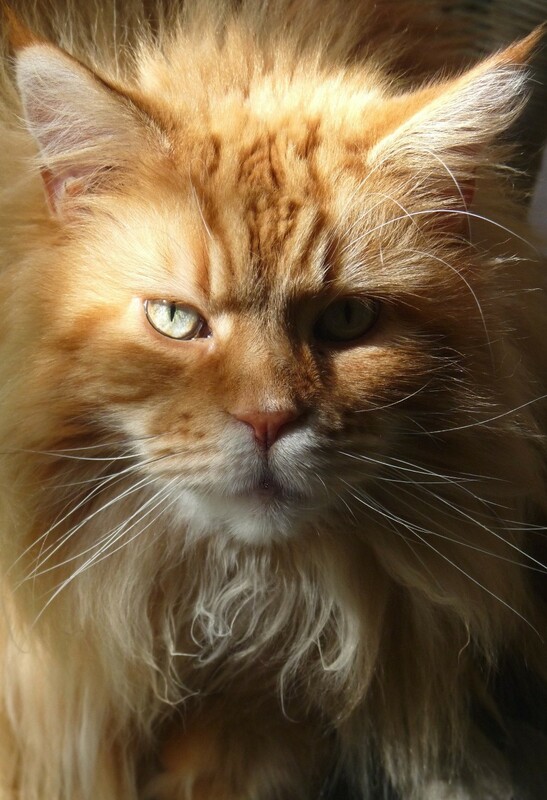 WORDLESS WEDNESDAY WITH DANTE: MY MANE MAN! DANTE AS "THE PURRPLE PEOPLE-EATER"! It's my husband Walter's birthday today, and I always like to make some sort of theme. This year I lavished him with purple presents. He got a purple fountain pen (a fine writing instrument), a purple ring (a large amethyst in gold) and a new purple shirt to dress up in. WATCH OUT FOR THE PURRPLE PEOPLE-EATER! I also added in my own handwriting: "May your birthday be JUST GRAPE, and I hope you don't meet with any VIOLETS!" Dante is so happy he could take part in making his Daddy's birthday special. He's looking forward to giving Daddy a big wet birthday kiss when he comes home tonight. He thinks his Daddy has really grape 'taste'. Yum! "I JUST LOVES PIE RATS -- MEE YOW!" Dante is on the front lawn, and what he sees does not make him very happy. No, not happy at all! The neighpurrs have cut down the spruce tree that borders our property. The mighty tree has fallen, and with it a home for many of our squirrel friends. "I cant beleefs it! ", says Dante sadly. "Its a time fur refleckshun. Dat tree an' I has many good memories." 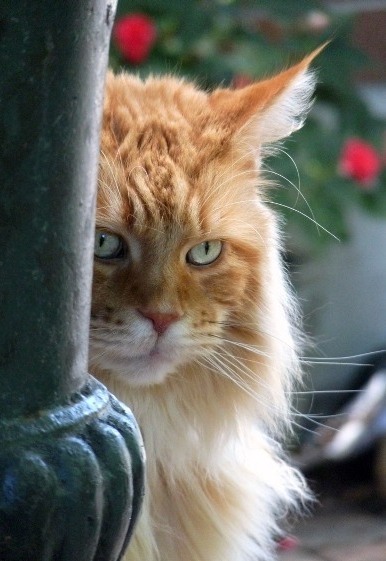 "Dis is da gool ole days, wen skwirrels liffed rite next door an' came ta visit efurry day." "But now dat's all in da past." "An' we hasta move forwahd. At leest mai gardin's still in bloom, even doe da leefs is stawtin' ta fall." "An' fur dat, I am verreh fankful!" "Goodbye sweet spruce, FIRever more." DANTE AIRS HIS DIRTY LAUNDRY! Dante's outside on the deck bench. There's an ever-so-slight drizzle in the air -- almost like a fine mist, which plumps up his already generous fur coat. "It's a good day to do my laundry", says Dante. Not one to PURRocrastinate, Dante gets right down to it! "I hate it when the furs get caught in my mouth!" "Although, they can be rather tasty." Dante's uses the 'gentle cycle' for his dainty (?) paws. "I treats them like kid gloves", says he. "Then there's that delectable stuff between the toes. Toe jam's always good for a snack if you gets a little peckish." On another note, sometimes Dante gets downright PAW-LICK-TICKLE. He tends to be DemoCATic, but it doesn't really count 'cause he's Canadian. Once Dante has finished washing the FURont, he allows it to air dry. You can see the ruffled fur on his head from all that intense scrubbing. Then he 'spins' around and attacks the other end. "Laundry can be a PURRsonal thing", he says. "So back off, willya?" So we did, as he attended to his nether regions. "Whew! ", Dante says. "Doing your laundry can be a real workout!" "But the results are worth it, don't you think?" "Suddenly, I feels all washed up! ", says Dante as he prepares to snooze. But Dante has one last trick up his furry sleeve. As an extra added bonus, he has made an action video for your viewing pleasure. He calls it "Dante Does His Duds". "Next time, I'm gonna steam clean", he says. "It's better for my self-esteam." WORDLESS WEDNESDAY WITH DANTE: HANGING LOOSE!